The Nautilus U616 Upright Exercise Bike MY18 2018 retains all the same high-end features of the previous U616 2014 model but comes with a redesigned console that’s now even more intuitive to use. The only other difference between the 2018 and 2014 bikes is that the overall design of the 2018 U616 is finished in a sleeker-looking overall black design compared to the 2014’s grey/silver color. 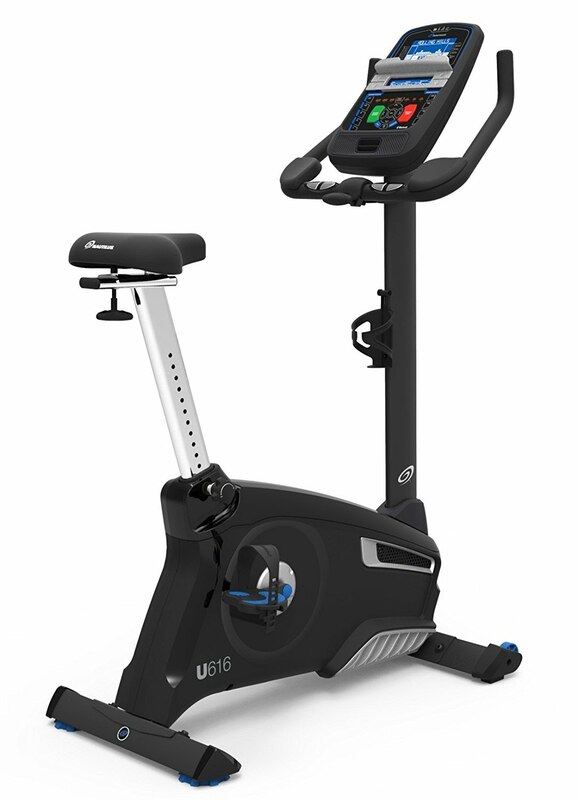 The Nautilus U616 Upright Exercise Bike MY18’s drive system comprises of a high-speed high-inertia perimeter-weighted flywheel and an ECB resistance system (Eddy Current Brake) which combine to ensure smooth and quiet operation. The Nautilus U616 Upright Bike 2018 offers plenty of options to keep your workouts motivating and challenging – there are 25 resistance levels and 29 customizable workout programs. Programs include workouts for profile, heart-rate, custom, fitness test, recovery test, as well as a Quick Start program to get you going. The Nautilus U616 MY18’s newly designed console is straightforward and easy to use and displays up to 13 workout stats on the easy-to-view Dual Track blue backlit LCD screens. Workout stats displayed include time, speed, distance, calories and heart-rate. Your heart-rate can be monitored by one of two ways as you cycle – contact grip pulse sensors in the handlebars or telemetry heart-rate monitoring with a wireless chest strap. Workout stats can be tracked for up to 4 different users and the Nautilus U616 2018 also offers Bluetooth connectivity so you can seamlessly transfer your workout data to online fitness tracking apps such as Nautilus Connect, Nautilus Trainer App and MyFitnessPal. 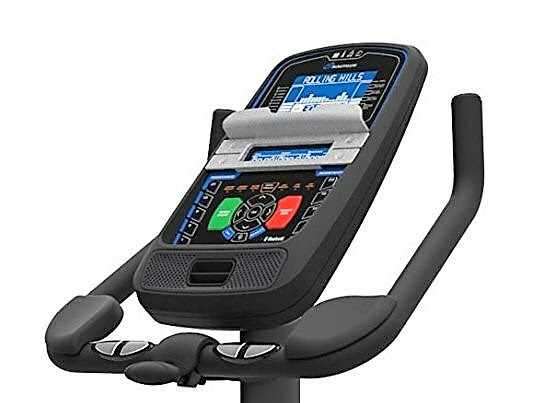 To help keep you cool and hydrated as you cycle on this exercise bike, the Nautilus U616 comes with a handy water bottle holder on the frame and a 3-speed cooling fan built into the console. Comfort ergonomic designs on the Nautilus U616 Upright Exercise Bike include a padded contoured saddle that is 4-way adjustable (adjusts up, down, forwards, backwards), angle adjustable handlebars with elbow rests, and oversized deluxe pedals with adjustable safety straps. The Nautilus U616 Upright Exercise Bike is sturdily constructed, incorporating oversized crossbar tubing and integrated levellers for added stability. This well-built bike allows for a maximum user weight capacity of up to 300 lbs. Fitness tip: Just a 30 minute cycle ride could burn between 207-345 calories for women or 252-420 calories for men, depending on the intensity of the workout. *Prices/discounts/shipping indicated correct at time of writing/publishing and may be subject to change anytime.